Several GIS packages facilitate the creation of grids or surfaces using statistical functions rather than just mathematical functions. 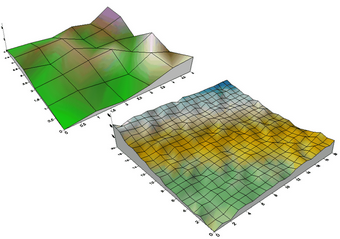 The generated surfaces may then be combined with existing surfaces or mathematically defined surfaces to create new grids which may be used for a variety of purposes: uncertainty modeling; providing reference grids for comparison or residuals analysis purposes; for the generation of idealized terrains; or for statistical analyses. ArcGIS provides a function for creating raster files whose entries are uniform random values in the range [0,1] or Normally distributed random z-values with mean=0 and standard deviation=1, i.e. z~N(0,1). The resulting grids can be modified (e.g. multiplied by a constant, adding an offset or trend) when generated or subsequent to generation. GRASS (r.random.surface function) provides similar functionality, but also facilitates a user-specified level of spatial dependence, implemented using a simple distance decay function with filtering. Figure 6‑7A and B illustrates the ArcGIS functionality, where a 250x250 grid with cell size 1 unit has been generated. Each cell is given a value independently as a random value from the chosen distribution. 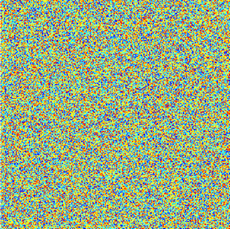 In the random uniform case all values will lie in the range [0,1] whilst in the Normal case values may take any value, but will typically fall within the bounds [‑5,+5], with just over 95% of values (the paler colors) falling in the range [‑2,2]. Figure 6‑7C shows a markedly different pattern, which has been generated by a hybrid random process designed to yield a surface with known fractal dimension, DC>2, and surface characteristics that are more terrain-like than purely random. 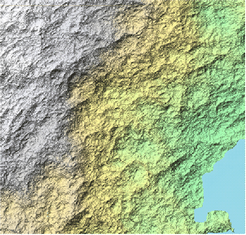 GIS software packages do not appear to provide models for artificial terrain generation, although this is an area that may be developed in future. This particular example was created using the Fractal Terrains package, which provides a range of fractal generation methods, from simple Brownian motion to various ridged multi-fractal procedures. In principle such methods could be implemented within many of the popular grid-oriented GIS packages using scripting or object-based programming, but there appear to be few examples of this at present. For more details on this area see Hanrahan et al. (2003, notably Chapter 16). A slightly different approach, based on random perturbation of mathematical surfaces, is illustrated in Figure 6‑8. 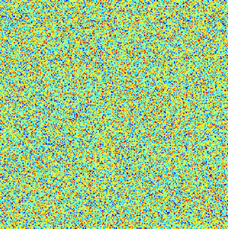 In this instance a simple linear surface has been modified by random perturbation of each cell. In the upper example a 5x5 grid and a random uniform function has been used; in the lower case a 20x20 grid and a random Normal function has been applied. Both examples were generated using the Grid|Functions facility in Surfer, followed by using the Map facility for the 3D surface visualization and wireframe overlay. The wireframe lines in this case are simply straight line connections between the grid values taken in x- and y-directions separately.